RIO’S NEW BOOK IS NOW AVAILABLE! This book discusses 12 universal laws, each one associated with a sign of the zodiac. Rio uses stories and personal anecdotes as well as quotes or references to mystics throughout history. He discusses ways of working with these laws to enhance spiritual growth and consciousness development. A signed copy is available from Rio Order by emailing him: rio@starwatcher.com or call him at (707) 887-1820. The price is $23.95 paperback and $33.95 hardback. Shipping and handling is $4. You can also order from the publisher iUniverse (orders@iUniverse.com) or Amazon. 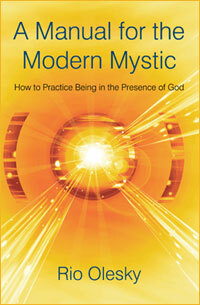 Host Ellen Kamhi, PhD RN, www.naturalnurse.com, interviews Rio on his book, A Manual for the Modern Mystic. A guide about how to weave spirituality into real-world experiences by following 12 basic, manageable laws. The word "mystic" often brings to mind a person who lives outside society in order to maintain his rarified state. However, Olesky (Astrology and Consciousness, 1995, etc.) writes that a mystic way of being can enhance every aspect of normal human existence—from childbirth to creative expression to simple tasks such as tidying a workspace or watering plants in a garden. His manual lays out universal laws he has identified (and followed) as guideposts for spiritually connected living. The laws correlate with the 12 zodiac signs, which Olesky has eloquently expanded to embody the full range of flesh-and-blood experience. For example, the possession-focused earth sign Taurus embodies the Law of Survival, while the expansive sign of Sagittarius correlates with the Law of Abundance. (Other laws touch on Creativity, Love, Harmony, Transcendence and other principles.) However, this is no mere astrological guide: Olesky fleshes out the principle behind each law before touching on the astrological correlation and explains the consequences of “not aligning” with each law. The book never becomes dry or preachy; Olesky draws on his own experiences as well as those of his family, clients and teachers to breathe life into each law and highlight the laws' relevance and achievability. The result is an eminently readable, heartfelt and soulful manual, graced by Olesky’s wisdom as well as quotations and ideas from spiritual teachers across the centuries. A passionate testament about interconnectedness that appeals to both heart and mind. In the “Manual For The Modern Mystic”, Rio Olesky presents a treasure of human knowledge to lead you deep into the world of metaphysical discovery. His book covers twelve basic principles for living consciously that range from the individual and family relations to society and the whole planet. It’s an adventuresome work, but Rio pulls it off with balance and clarity. so they form a unified map readers can use to chart their progress on their journey to spiritual awakening. This book challenges you to think. and dumbed down by corporate and government propaganda. Get the book and stretch out your mind! How Does Your Astrological Chart Affect Your Spiritual Development? An in depth analysis of the prime astrological variables: signs, planets, houses and aspects. This book delineates these concepts on material, psychological and spiritual levels. By drawing from myth-ological references, personal insights, experience and humor, Rio illustrates how astrology can be used for the purpose of self-awareness and consciousness development. This is a valuable introduction into an ancient, vast subject as well as a handy reference book for intermediate and advanced students. Published by New Falcon Press, Tempe, AZ. Illustrated, 348 pages. Price: $16.95 plus postage. California residents add $1.61 sales tax. 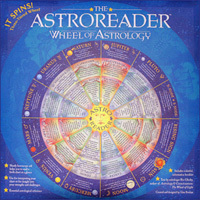 A handy horoscope aid that helps you to read a birth chart at a glance. Use it for interpreting your chart or for insight into your strengths and challenges. Includes a colorful, informative booklet. $19.95, plus postage. California residents add $1.75 sales tax. 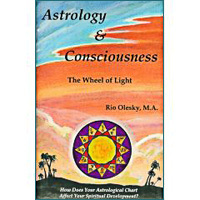 "Rio Olesky is once in a generation astrology genius, who can explain in written or spoken form astrological concepts and charts to anyone of any aptitude." "Rio has an amazing talent in helping to empower people, boost their self growth and gain the keys to greater self discovery through his wonderful teachings"
"Rio writes from his direct experience watching astrology work in his clients' charts. Because of his skill as a teacher and his heart-centered approach, this is a valuable book-especially for anyone new to astrology."